Why the Duck? The story starts in the mid-60's when the Montreal police were about to lose control of the city to corruption and street gangs. A small special unit the Rubber Duck Squad managed to reclaim the control of the streets with creative and innovative concepts. Taking a page from their playbook, our small bartending unit is ready to take the nightlife by storm. The Rubber Duck Squad would like to welcome you to the Coldroom. After making a name for himself behind one of Montreal's OG cocktail bars, la Distillerie, and by having done multiple shocking cocktail presentations through many competitions, Dan now brings his knowledge and knowhow to the heart of the Coldroom. Maybe not as much behind the bar anymore,however, you will probably see him hidden in a corner making sure everything is going smooth, fixing the dishwasher or calling any or all technical supports for something. He is also the main person behind those blues & rock playlist that you can hear while enjoying a good cocktail at the Coldroom. If not at Coldroom, he is either getting punched in the face while boxing or walking his famous dog Missy. National Finalist - Bombay Most Imaginative (2017). The genius behind most of the flavors of Coldroom for so long, Pete, joined us in fall 2016 and has been shooting delicious cocktails at people since then. Know as the “Gunslinger bartender”, #pistolpete / #pierrepistolet / #pistoleropedro will make you forfeit with an unexpected duel of flavors. An old story says that he was late on his first ever busboy training, 8 years ago, but his mentor forgave him and even brought him at Coldroom years later. This artist made a name for himself as a creative mastermind but mostly because he is always humble and probably one of the nicest in this industry. Molded by La Distillerie years ago, where he met Daniel, he went on building menus and managing establishments before landing officially at the Coldroom. There is so much to say about the stunning Aidan. He came here from the far away land of Ottawa and was the first ever person to pass an interview to work at The Coldroom. He was born through the fire of our opening day:September 21st 2016, as a junior, and has since then rose as one of the pillars on which our bar stands today. Now, head bartender with more than 6 years experience in the industry, his cocktails are like the arrows of a competitive archer, they always hit the bullseye. Little did we know that even though he is a spirit enthousiast and a wine connoisseur, Aidan is a fervent collector of shoes which got him an interview for a shoe magazine.For us, he is one of our main players on the basketball court despite not wearing the afro anymore with his sick golden banana bike. Hailing from way down under, Copacabana in Australia, international bartending sensation Sam cut his teeth in the dives and nefarious drinking houses of East London. His time involved moonlighting as a bathtub gin distiller and part time chemist. Returning triumphantly home to Sydney, Sam felt that a spell of the books bartending was in order. He then learnt the most important lessons in bartending; how to make a pun for every cocktail name and how to make 15 espresso martinis in one go. No man to rest on his laurels, Sam decided he wanted the world, and adventure, and to see what it's like to make a cocktail at -30 celsius. Montreal is now his home. You can find him in the depths of the Coldroom, since early 2017, churning out all sorts of wild libations that will make you exclaim "FOH!". It was in spring 2017 that Olivier joined our rank and we wouldn’t be able to imagine the Coldroom without him. Known as the bearded bartender, he uses speed and determination in all his movements. When he is not shaking cocktails with breathtaking motions, he spends his time at the art gallery GHAM & DAFE, where is is co-founder and administrator, to express his skill as a visual artist. Otherwise, his sense of humour is only equal to his skills as a dancer. If you are lucky enough, you might see him on a dance battle against Daniel Boulianne somewhere in town. His special move, you ask? The jazz-split. Originally from Edmonton, Alberta, Damon arrived in the bar industry in 2013. Serving drinks with ease and exceeding expectations, he naturally found his way to the Coldroom, where he became an apprentice in August 2017, showing us how everything starts with hospitality. Since then,he has moved up the ranks due to his hard-working personality and amazing customer service. Damon is one of those who will make sure that you spend a memorable time and you’ll realise why he is our dear precious. Cultivated in Russia, Nicolae ended up in Montreal after living in multiple countries. His passion for stories and cocktails is only matched by his obsession for wordplay. He started in the industry 5 years ago, at 19yo and went from barback to acrobatic bartender while working at Le Lab. He’s been with us since summer 2017 and if he’s not looking at the stars in the sky, he is smoldering us with a mysterious eye. Sweet like chocolate, addictive like cheese and a fresh smile like the Swiss Alps, Mathias has been with us since early 2018 with 2 years experience in the industry. This sassy Swiss boy from spanish descent will make you see a whole new world. The way to his heart you asked? Motorcycle, ski, overproof rum and raclette would be the perfect night. Fairly new to the cocktail bartending industry yet spent the last 7 years close to the scene. Bastien added himself to our team in early spring 2018 and has, since then, shown how much of a fan for dad jokes and doubtful puns he is. He was once known as the chalkboard guy, but now, when he is not planning a social daytime activity for bartenders, you can find him riding his bicycle on St-Laurent, climbing in some bouldering centers or enjoying a cold beer in parc Lafontaine. His charm and hair flow are legendary amongst the bartending elite. But on an everyday basis, he takes great pride in being part of the Montreal bartending community. Our smallest bundle of joy, Cindy joined us in early spring 2018 and what she lacks in size she makes up in terrible dad jokes. Her spirit animal is a T-Rex: small arms, a loud growl and really aggressive if hungry. Her determination got her the position she wanted and when she applied, we were to scared to say no to her and there isn’t a day that we regret that decision. Speaks 4 languages and will make you laugh in each one. Be careful, she’ll make you want to stay all night with her amazing customer service. Kevin has drive and willingness to learn in everything that he does. He highly values sports but also exercises his mind and spirit through yoga and meditation. Always asking the right questions, he is someone that quickly learns new things. His million-dollar smile draws people to him for great conversations, whatever the topic. Kevin started with us in early spring 2018 and took part in his first cocktail competition, Made with Love, in winter 2018 and since then, is constantly looking for new challenges. You want to please him? Ask him about his pins on his apron. Recently moved to our great country, from Byron Bay in Australia, for the love of his life, Seb started with us in spring 2018. He already had 7 years of experience in the pub industry and even managed a few of them, but cocktails was a new and exciting land of opportunities for him. He is a man of many passions such as learning french, bartending and choking people. When he is not amongst us seducing everybody with his charming accent, you can find him competing in some jiu-jitsu competitions which he focused on after 10 years of MMA. After more than 8 years in the bar industry and 5 of them as management, Jon has become a renowned bartender from our industry. This half Chilean half Moroccan beauty joined us on the summer of 2018 and has, since then, consistently delivered an amazing experience to our guests. If Jon is not at work showing his passion for bartending, he is either spending quality time with his young daughter or doing sports such as yoga, muay thai, rock climbing and much more through the Bartender Fitness League. A league which he founded to promote healthy lifestyle in this hectic industry. Sophy came to Coldroom from the great city of Toronto. Returning from working abroad in Australia, she joins us with experience in notable restaurants all over the world. She started her career in kitchen as pastry chef then moved on the to floor and bar. She makes the wildest flavours come to life in your cocktail. Involved in the culinary world for close to a decade, Kevin always had an unquenchable thirst for cocktails. Using his creative, knowledgeable and hospitable approach, it was only a matter of time before he started mixing cocktails. If he’s not kicking back with an old-fashioned in hand; Kevin can be found doing stand-up comedy around the city, running his own productions company and working for the Montreal Alouettes. New in the bar industry, Axel is no stranger to customer service. Since starting with us in winter 2018, he has been hitting the books on all things cocktail related to get as much knowledge as he can to be fully ready for the next steps. Cool, calm, collected and observant are the qualities that best describe him and his drive to learn is what makes him the perfect apprentice. 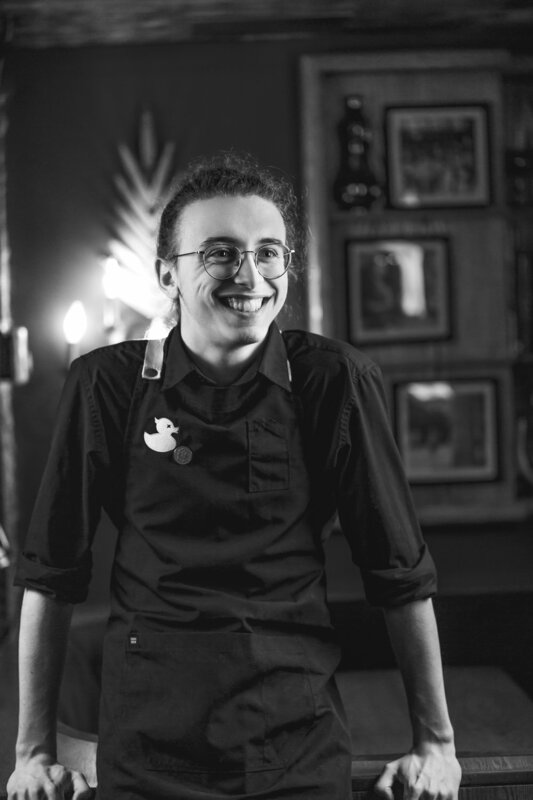 One of our newest recruit, and also our youngest member, Gaspard will strike you with his contagious smile and joie de vivre. Born and raised in Montreal, he had the opportunity to travel different places in the world which gave him a great maturity despite his young age. Recently finished his cocktail training at ITHQ with only great comments from his teacher, you’ll either find him studying everything about cocktails or playing some drums on his spare time. Born in the land of Calvados in Normandie, France; David joined our team in winter 2018 with 5 years experience. He trained himself in London from a renowned 5 star hotel, cocktail club and cocktail bars. Spending his first year in Canada, he is still adjusting to our hard weather, despite being a passionate skier. Otherwise, don’t trust his pokerface, he is one of the funniest person and will make you some mean cocktail creation. Born and raised in Montreal, Dominic joined us at the end of 2018 after working many years at Red Tiger restaurant. After 5 years in the industry working at night, he still promotes healthy lifestyle and does many sports. He was even a pro downhill skater in a past life. Kevin Demers has been part of the bar industry for more than a decade now and always does his best to bring the community further. After many years of bartending and many competitions titles behind him, he decided to open The Coldroom in 2016, a venue where the priority is hospitality but where the standards are as high as they can be for the team. The bar has become one of the go-to for tourism and locals alike, Kevin wanted to create a new experience, something never seen. In 2018, he opened El Pequeno, which is the smallest bar in Quebec (mto be confirmed in Canada as well) with a maximum of 9 guests at the same time, in a old Havana hotel atmosphere. 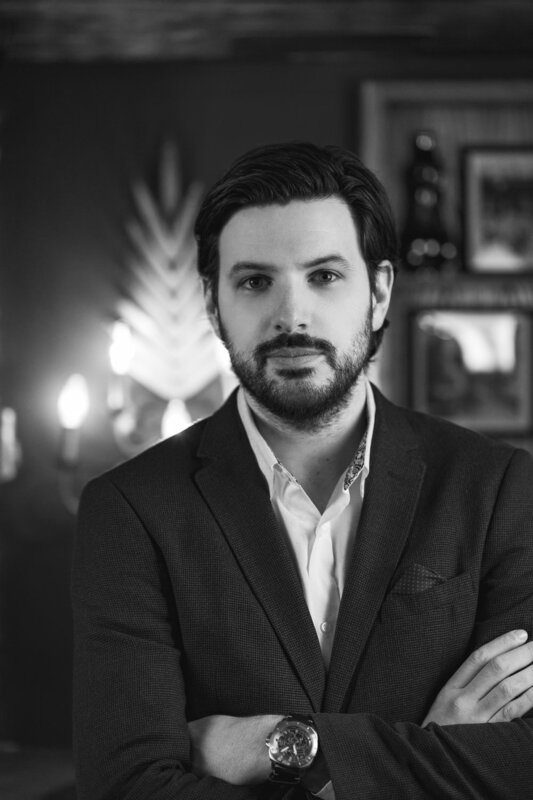 He is also the founder of the Montreal Cocktail Initiative which created the Montreal Cocktail, a modern classic that was presented at Tales of the Cocktail in 2017. Kevin is the kind of man who can’t stay still for long, so there is always something else on the way… Keep your eyes and ears open just in case.